Dry weather and the end of my final season of woodland courses had kept me well away from the office until yesterday, when I thought I’d catch up on my blog. I spent a frustrating morning trying to match the photos to the text with little success, so spent the afternoon picking autumn raspberries and cooking french apple tarts. 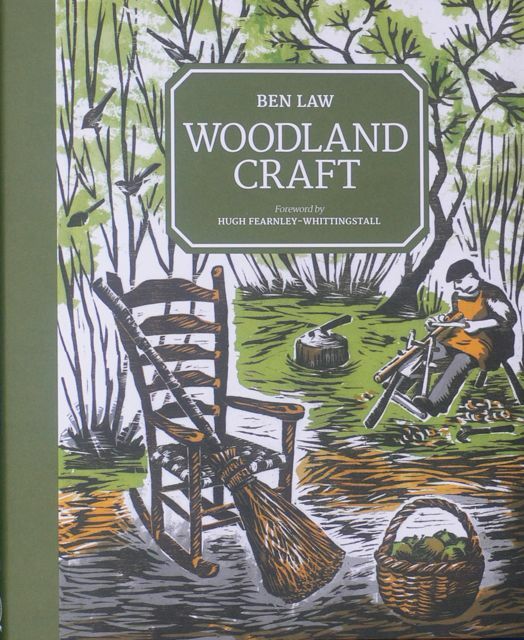 This morning I woke refreshed and spent a jolly hour or so with my wife Tamsin, looking through Ben Law’s latest book ‘Woodland Craft’ and comparing it with a few others. So here are a few thoughts. Ben Law has been writing books for about 15 years, mainly for Permanent Publications, who produce Permaculture Magazine. They have now linked up with GMC, who published my first book ‘Green Woodwork’ back in 1989. I wrote the book 4 years into my career running green wood courses and it was clearly a book about my attempts to rediscover many of the skills that had been lost over the course of the 20th Century and was never meant to be a professional manual. About 5 years after its publication, GMC asked if I would work on a much needed 2nd edition. By this time I had met Tamsin, an excellent illustrator and we decided that it would be fun to publish our own update, so I kept GMC dangling for several years until we produced ‘Living Wood’ ourselves. 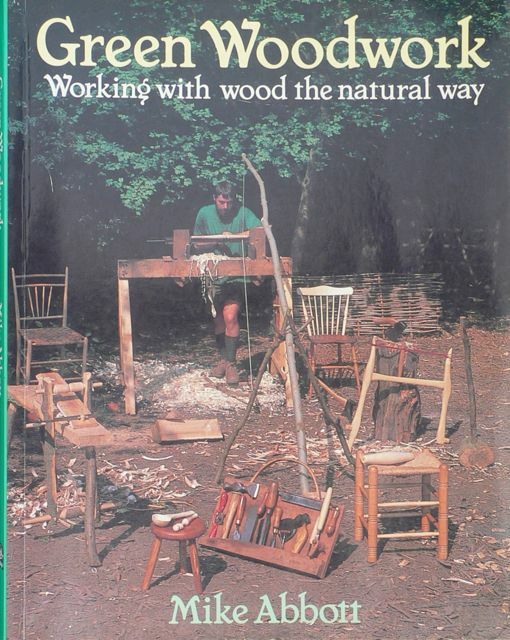 Every few years, GMC and I would tentatively discuss a 2nd edition for ‘Green Woodwork’ but we could never agree on the contract, so now they are linked with Perm Pubs, Ben Law was the obvious man to bring out a new book on greenwood/woodland crafts. (I’m not sure why his book has dropped the ‘s’ in Crafts). I haven’t yet read it cover-to-cover but as always, Ben has written the book well on the range of topics (mainly associated with sweet chestnut) with which he is now very familiar. Other topics, such as hazel hurdles, laths, willow baskets and chair-making are well covered by specialists in these areas. This gives a far more professional approach to the topics than my ham-fisted first attempts in ‘Green Woodwork’. 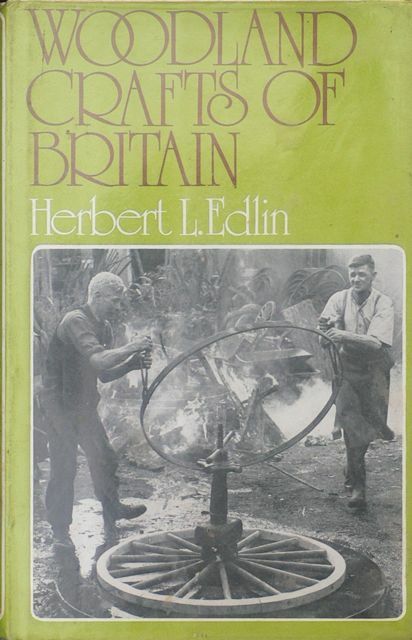 In this respect it almost harks back to the real classic book on the subject, Herbert Edlin’s ‘Woodland Crafts in Britain’, a book that must have taken years of research and will certainly never be equalled. As well as the practical step-by-step instructions, Ben’s new book contains many good quality illustrations but where it is dreadfully let down is in the photographs. It appears that the publishers have paid for a pro photographer to spend a day taking a load of pretty atmospheric pics, which are given double page spreads, while poor old Ben has had to take most of the other photos himself and they have been squeezed so small that it is very difficult to gain anything useful from them at all. 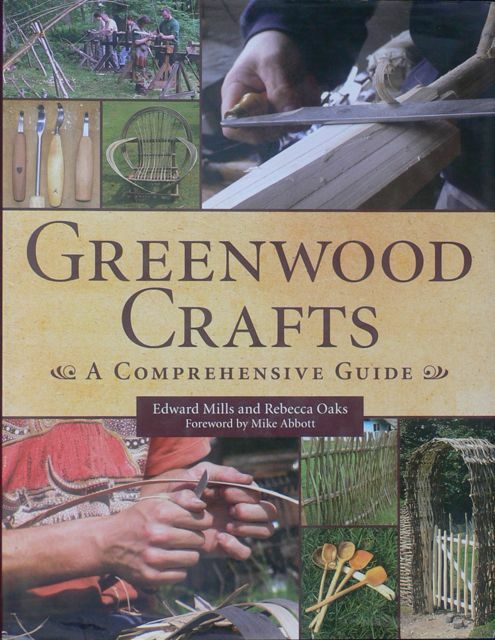 This prompted me to search out my copy of ‘Greenwood Crafts’ by Rebecca Oaks and Edward Mills, published by Crowood Press in 2012. Along with another of their books (‘Windsor Chairs’ by James Murcell) they have made a real effort to achieve a high quality in their photos. Because Rebecca and Edward are based in the English Lake District, this book has quite a different emphasis on the crafts covered and I feel it is more suitable for anyone who is new to the world of greenwood/woodland crafts. It has a complete chapter on setting up a greenwood workshop as opposed to Ben’s book which, although it has lots of (tiny) photos of a range of tools, only has a double page spread of drawings of the devices that are so critical to the success of these crafts. So my conclusion is that Green Woodwork is a nicely written reminder of the sorry state of green wood crafts in the 70’s and 80’s (and how good looking I once was!). If you want to read how to get started, then I would suggest, Mills and Oaks is the book to get you underway but for a well written guide for those who have already entered into the green wood world, then Ben Law’s book will inspire you to further achievements. However no book will ever compare to Edlin’s classic and no book will ever compare to learning these skills at first hand from a skilled teacher.